With this version of antMan & antHill, you'll be able to easily configure an .antsle.us subdomain for antMan. This will allow you to access antMan through <subdomain>.antsle.us within your local network. The subdomain feature goes hand in had with new HTTPS for antMan. We take care of transferring the SSL certificates to your antsle device, and install/configure them for you. Now you can have encrypted communication from your local network to antMan! Please note that you'll be communicating directly to your antsle, without going through our servers. Plus this enables a super cool new feature that you'll love! Added a "Forgot your password" feature for your antHill account. Also addressed various small issues. This feature is recommended to be used with the https enabled antMan (highlighted above). And yeah, it looks pretty cool too! 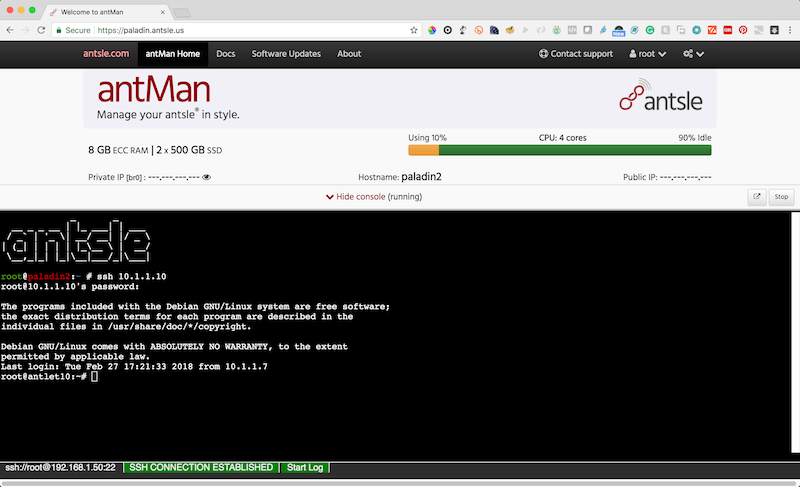 Login to your antsle via ssh: ssh root@myantsle.local, run the upgrade script: upgrade-antman. Once the process is complete, you can go to anthill.antsle.com and set a subdomain on your antsle in your dashboard. If you haven't activated your antsle in antHill yet, have a look at this! Then make a new tab in your browser and point it to http://<myantslename>.local or https://<subdomain>.antsle.us if you set the subdomain. Enjoy using HTTPS antMan!